I had thought that free fatty acids were triglycerides. But I am reading a study that measured both. Can someone enlighten me on free fatty acids? … please. I think I can help. The good news is that, contrary to the college myth, organic chemistry is easy — it is freshman chemistry that is hard because it has more physics and mathematics. Now, jumping into lipid metabolism is a little bit of starting in the middle of things but the reason organic chemistry is easy is that it has only a few assumptions and basic principles and the basic theory, at least, is logical and you can get pretty far deducing things from simple principles, so with a few basic ideas we may have a shot. I have two YouTube videos that are short, relatively easy and might be a background. The take home message from the videos, the one big idea in organic, is that organic compounds have two parts: A hydrocarbon backbone and a non-hydrocarbon part that contains the chemically reactive part of the molecule, the functional groups. The assumption is that all compounds with the same functional group have similar chemistry. So, for example, all carboxylic acids have the carboxyl (-COOH) functional group. In many ways, even a simple acid like acetic acid has chemical properties that are similar to a complicated acid, like the fatty acids. You may need the YouTube to appreciate this: chemistry is about structure, that is, it is visual. All dietary and body fats and oils are triglycerides (TG) or, more correctly, triacylglycerols (TAG). The term “acyl” (pr. A-sill) is the adjective form of acid (i.e. There are three acids). Fats have a roughly E-shaped structure. The arms of the E are the fatty acids and there are three of them. The fatty acids provide the real fuel in fats. The three fatty acids are attached to the compound glycerol which is the vertical stroke of the E. The chemical bond that attaches the fatty acid to the glycerol is called an ester bond. You only need to know the term ester because when the fatty acids are found alone, especially in blood, they are referred to either as free fatty acids (FFA) or, because they are no longer attached to the glycerol by the ester bonds, as non-esterified fatty acids (NEFA): FFA and NEFA are the same thing. Metabolism: the fatty acid-TAG cycle. The digestion of fat in the intestine involves the progressive removal of the fatty acids from the first and last position of the glycerol. The process is called lipolysis and the enzyme that catalyzes the reaction is called a lipase. What remains is called 2-monoacylglycerol, or 2-MAG (fatty acid still attached at the center carbon of glycerol) and 2-MAG and the free fatty acids from digestion are absorbed into the intestinal cells. Within these cells they are re-formed into TAG which is exported together with cholesterol and other components in particles called chylomicrons. Chylomicrons, in turn, represent one type of complex structure known as lipoproteins. The lipoproteins transport lipids and some of these are familiar, e.g., LDL (low density lipoprotein), HDL. Triglycerides in the blood are carried in these particles. So this is probably the triglycerides you read about. Fat (TAG) is continually broken down and re-synthesized. The breakdown process is called lipolysis and the lipolysis-synthesis cycle goes on in different places in the body but notably in fat cells. An interesting thing about fat cells is the way they carry out the cycle. Lipolysis is a simple process but synthesis is complicated. Speaking in energy terms, it is easy to break down nutrients. It requires energy to put them back together. 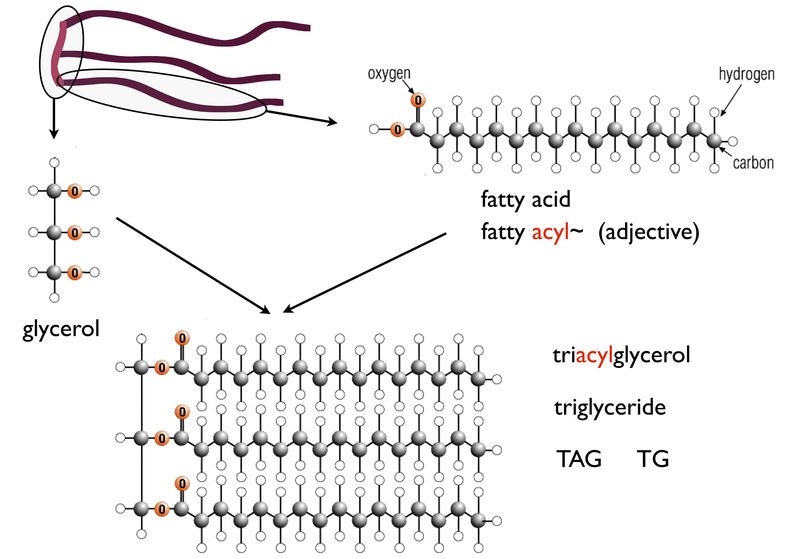 To make TAG, either the glycerol or the fatty acid has to be “activated”: so the actual reactive form is a molecule called fatty acyl-coenzyme A or fatty acyl-CoA (pr. Co-A). Biochemical reactions almost never run by themselves even if energetically favorable but are rather controlled by catalysts, that is, enzymes. The enzyme that catalyzes the first step in the reaction, a transferase, will not work with glycerol itself. The enzyme requires a particular form of glycerol, glycerol-phosphate. The special characteristic of the fat cell is that the required glycerol-phosphate cannot be made directly from glycerol as it can, for example, in the liver which also has an active fatty acid-TAG cycle. In order to make glycerol phosphate, fat cells require glucose. In the absence of glucose, as in starvation or a low carbohydrate diet, fat synthesis is repressed. At the same time the enzyme that catalyzes breakdown, hormone-sensitive lipase, is enhanced because it is turned on by glucagon and turned offby insulin (these are the hormones in the term “hormone-sensitive lipase”). This was the original rationalization for the apparent advantage in a low-carbohydrate diet: without carbohydrate the adipocyte would not be able to supply glycerol-phosphate and the fatty acid-TAG cycle would go largely in one direction: breakdown to produce fatty acids and this is undoubtedly one of the major effects. It turns out, however, that the fat cells protect stores of energy in fat by other methods. We now understand that cells run a process called glyceroneogenesis which is a truncated form of gluconeogenesis, the process whereby glucose is synthesized from other nutrients, mostly protein, that is, the process supplies an intermediate in the synthesis of glucose and this can be converted to glycerol-phosphate. Generally, especially if the diet is hypocaloric, the net effect is to break down fat and supply fatty acids as a fuel for other cells. Fatty acids circulate in the blood bound to a protein called albumin. Under conditions where there is higher carbohydrate, however, and the fatty acids are not being used for fuel, they can stimulate insulin resistance. So, fatty acids in the blood are a good thing if you are breaking down fat to supply energy. They are not so good if you are over-consuming energy or carbohydrates because, in the presence of insulin, they can lead to insulin resistance. Summary: triglycerides are made of three fatty acids. There is a continual fatty acid-TAG cycle that goes on all the time in different cells. Triglycerides in the blood are carried in lipoprotein particles, chylomicrons, LDL, HDL. Fatty acids in the blood are carried by the protein albumin. Fair and Foul on the Diabetes Scene. DiabetesHealth beats Jay Leno but the ADA takes the Cake. 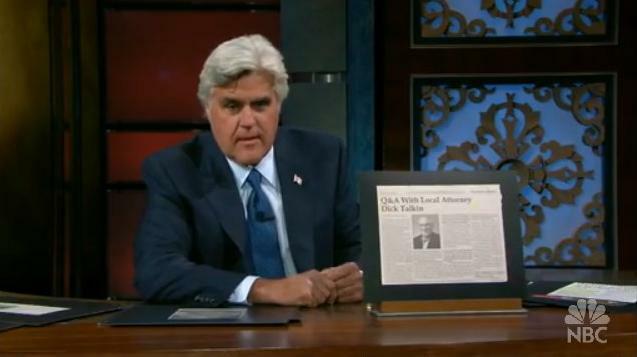 “Headlines” is one of Jay Leno’s routines on The Tonight Show. While low on production values, it provides amusing typos, odd juxtapositions of text and inappropriate couplings from real notices and newspapers. The headlines are frequently very funny since, like fiction in general, authored comedy has to be plausible. There have been many other versions of the same idea including items in the New Yorker but Jay Leno’s audience rapport adds to the impact. Expert as he is, though, Jay seemed a little off guard when nobody laughed at the headline: “The Diabetes Discussion Group will meet at 10 AM right after the pancake breakfast.” It’s probably generational. 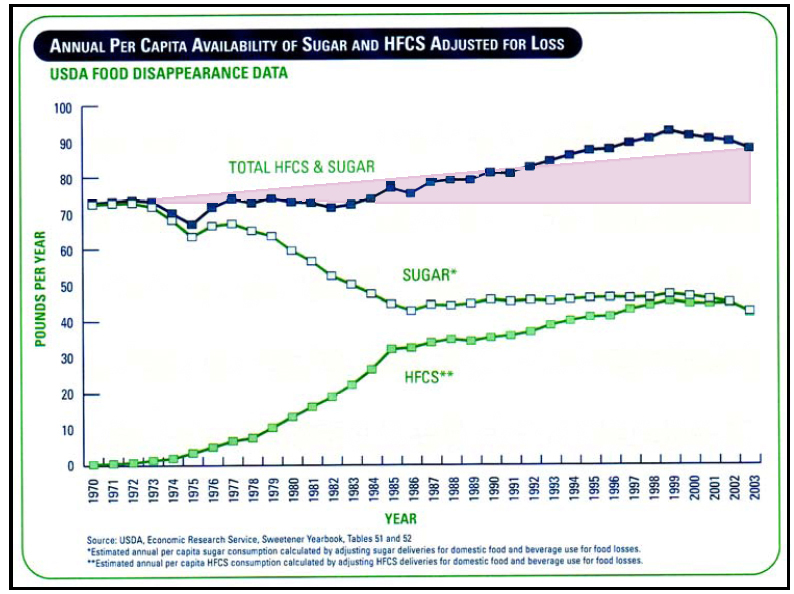 After 30 or so years having the American Diabetes Association tell you that sugar is Ok as long as you “cover it with insulin” and that diabetes, a disease of carbohydrate intolerance, is best treated by adding carbohydrate and reducing fat, who knows what anybody believes. One of the headlines on a previous show that did get a laugh said: “To increase gas mileage, drive less.” (If Jay only knew how much we spent to get the USDA committee to come up with the advice that if you want to lose weight, you should eat less). So how did people with diabetes fare on the maple syrup? Well, there were no people. Or animals. 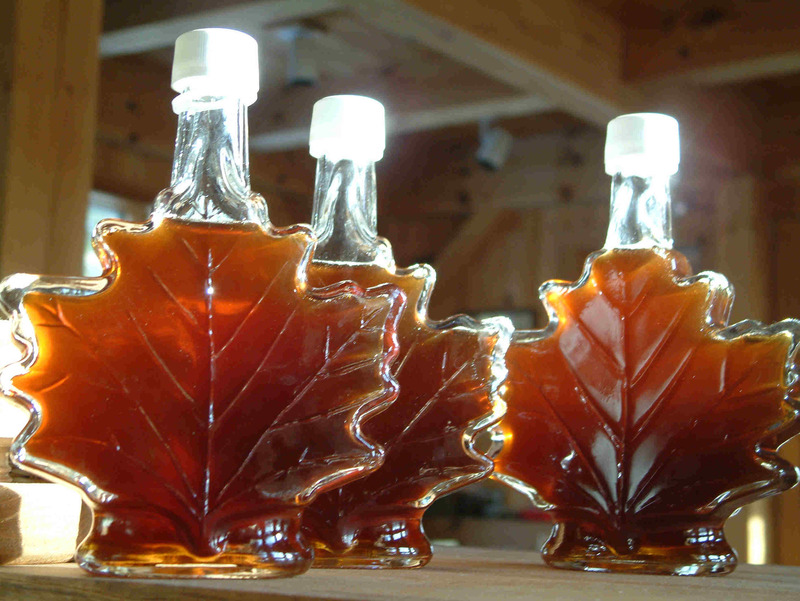 The researchers did not test the effect of consumed maple syrup but only chemically analyzed samples of the stuff. “You might want to pause for a moment before rushing out and buying jug after jug of Canada’s finest maple syrup, though. It still contains plenty of sugar,…” In fact, by far the major ingredient in maple syrup is sucrose which, again, only has to be “covered” with insulin. 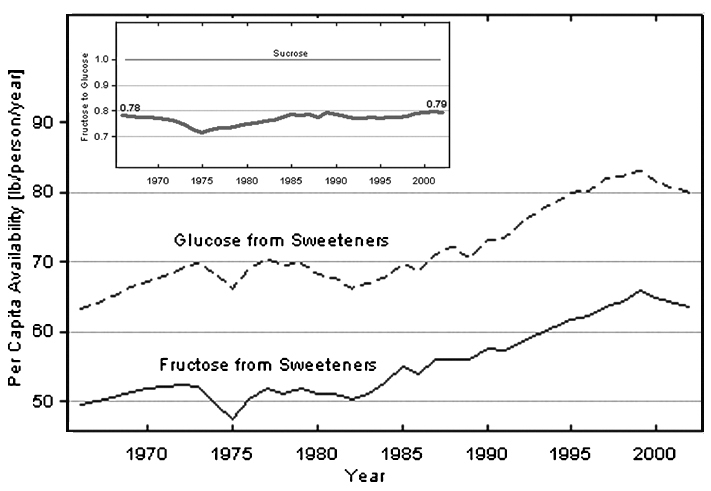 So, with all those beneficial compounds, we will need less insulin per gram of sucrose with maple syrup, right? Would Jay Leno have gotten a laugh if the diabetes meeting followed the pancakes and maple syrup breakfast? How about if they were whole grain pancakes? Not to be outdone, the American Diabetes Association website offers the lowdown on just how good grain is. Fiber, in general, is so good for you that you should be careful not to snarf it up too fast. As they point out, it is “important that you increase your fiber intake gradually, to prevent stomach irritation, and that you increase your intake of water and other liquids, to prevent constipation.” Doesn’t really sound all that healthy but foods with fiber “have a wealth of nutrition, containing many important vitamins and minerals.” Now, vitamin deficiency has always seemed to me to be the least of our nutritional problems but there’s more: “In fact,” using fact in its non-traditional meaning, fiber “may contain nutrients that haven’t even been discovered yet!” (their exclamation point). Not to belabor all the metaphors here, the ADA, long telling us that people with diabetes deserve to have their carbs, are surely offering pie in the sky. The big news in the low carb world is that Consumer Reports has published, for the first time, faint praise for the Atkins diet. However, the vision one might have of CR employees testing running shoes on treadmills doesn’t really apply here. They did not put anybody on a diet, even for a day. They didn’t have to. They have the standards from the government. Conform to the USDA Guidelines and CR will give you thumbs up. It probably doesn’t matter since, these days, most people buy a food processor by checking out the reviews on the internet — there are now many reviews online of what it’s like to actually be on a low-carbohydrate diet, so rather than follow CR’s imaginings of what it’s like, you can check out what users say — Jimmy Moore, Tom Naughton and Laura Dolson together get about 1.5 million posts per month with many tests and best buy recommendations. What caught my eye, though, is the ubiquitous Dean Ornish; the ratio of words written about the Ornish diet to the number of people who actually use it is probably closing in on a googol (as it was originally spelled). The article says: “to lose weight, you have to burn up more calories than you take in, no matter what kind of diet you’re on. ‘The first law of thermodynamics still applies,’ says Dean Ornish, M.D. That’s how I got into this field. 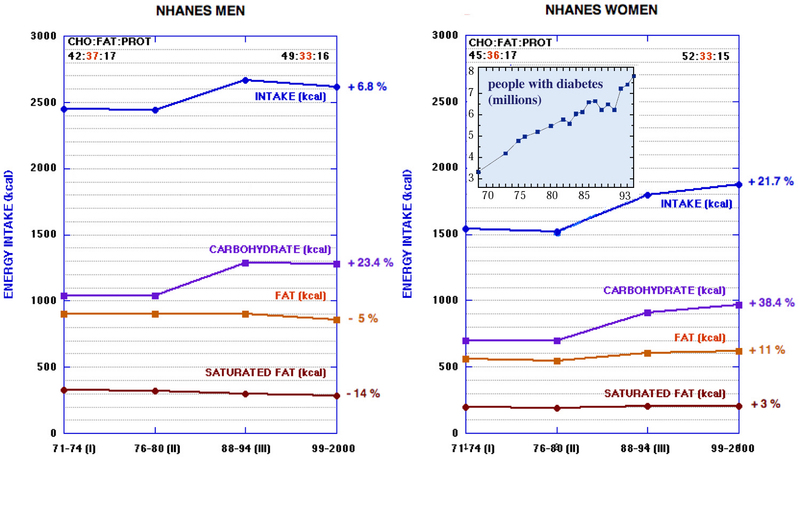 My colleague Gene Fine, and I published our first papers in nutrition on the subject of metabolic advantage and thermodynamics and we gave ourselves credit for reducing the number of people invoking laws of thermodynamics. “Metabolic advantage” refers to the idea that you can lose more weight, calorie-for-calorie on a particular diet, usually a low-carbohydrate diet. (The term was used in a paper by Browning to mean the benefits in lipid metabolism of a low-carbohydrate diet, but in nutrition you can re-define anything you want and you don’t have to cite anybody else’s work if you don’t want to). The idea of metabolic advantage stands in opposition to the idea that “a calorie is a calorie” which is, of course, the backbone of establishment nutrition and all our woe. As in the CR article, whenever the data show that a low-carbohydrate diet is more effective for weight loss, somebody always jumps in to say that it would violate the laws of thermodynamics. Those of us who have studied or use thermodynamics recognize that it is a rather difficult subject — somebody called it the physics of partial differential equations — and we’re amazed at how many experts have popped up in the nutrition field. Finding the right diet doesn’t require knowing much thermodynamics but it is an interesting subject and so I’ll try to explain what it is about and how it’s used in biochemistry. The physics of heat, work and energy, thermodynamics was developed in the nineteenth century in the context of the industrial revolution — how efficiently you could make a steam engine operate was a big deal. Described by Prigogine as the first revolutionary science, it has some interesting twists and intellectual connections. The key revolutionary concept is embodied tin the second law which describes the efficiency of physical processes. It has broad philosophical meaning. The primary concept, the entropy, is also used in communication and the content of messages in information theory. The entropy of a message is, in one context, how much a message has been garbled in transmission. The history of thermodynamics also has some very strange characters, besides me and Gene, so I will try to describe them too. First, we can settle the question of metabolic advantage, or more precisely, energy inefficiency. The question is whether all of the calories in food are available for weight gain or loss (or exercise) regardless of the composition of the diet. Right off, metabolic advantage is an inherent property of higher protein diets and low carbohydrate diets. In the first case, the thermic effect of feeding (TEF) is a measure of how many of the calories in food are wasted in the process of digestion, absorption, low-level chemical transformation, etc. TEF (old name: specific dynamic action) is well known and well studied. Nobody disputes that the TEF can be substantial for protein, typically 20 % of calories. It is much less for carbohydrate and still less for fat. So, substituting any protein for either of the other macronutrients will lead to energy inefficiency (the calories will be wasted as heat). A second unambiguous point is that in the case of low-carbohydrate diets, in order to maintain blood glucose, the process of gluconeogenesis is required. You learn in biochemistry courses that it requires a good deal of energy to convert protein (the major source for gluconeogenesis) into glucose. So, right off, metabolic advantage or energy inefficiency is known and measurable. Critics of carb restriction as a strategy admit that it occurs but say that it is too small in a practical sense to be worth considering when you are trying to lose weight. These are usually the same people who tell you that the best way to lose weight is through accumulation of small changes in daily weight loss by reducing 100 kcal a day or something like that. In any case, there is a big difference between things that are not practical or have only small effects and things that are theoretically impossible. If metabolic advantage were really impossible theoretically, that would be it. We could stop looking for the best diet and only calories would count. Since we know energy inefficiency is possible and measurable, shouldn’t we be trying to maximize it. But what is the story on thermodynamics? What is it? Why do people think that metabolic advantage violates thermodynamics? What is their mistake? More specifically, doesn’t the first law of thermodynamics say that calories are conserved? Well, there is more than one law of thermodynamics and even the first law has to be applied correctly. Let me explain. (Note in passing that the dietary calorie is a physical kilocalorie (kcal; 1000 calories). There are four laws of thermodynamics. Two are technical. The zeroth law says, in essence, that if two bodies have the same temperature as a third, they have the same temperature as each other. This sounds obvious but, in fact, it is an observational law — it always turns out that way. The law is necessary to make sure everything else is for real. If anybody ever finds an experimental case where it is not true, the whole business will come crashing down. The third law describes what happens at the special condition known as the absolute zero of temperature. In essence, the zeroth and third laws, allow everything else to be calculated and practical thermodynamics like bioenergetics pretty much assumes it in the background. The second law is what thermodynamics is really about — it was actually formulated before the first law — but since the first law is usually invoked in nutrition, let’s consider this first. The first law is the conservation of energy law. Here’s how it works: thermodynamics considers systems and surroundings. The thing that you are interested in — living system, a single cell, a machine, whatever, is called the system — everything outside is the surroundings or environment. The first law says that any energy lost by the system must be gained by the environment and any energy taken up by the system must have come from the environment. Its application to chemical systems, which is what applies to nutrition, is that we can attribute to chemical systems, a so-called internal energy, usually written with symbol U (so as not to confuse it with the electrical potential, E). In thermodynamics, you usually look at changes, and the first law says that you can calculate ΔU, the change in U of a system, by adding up the changes in heat added to the system and work done by the system (you can see the roots of thermo in heat machines: we add heat and get work). In chemical systems, the energy can also change due to chemical reactions. Still, if you add up all the changes in the system plus the environment, all the heat, work and chemical changes, the energy is neither created nor destroyed. It is conserved. Now, why doesn’t the first law apply to nutrition the way Ornish thinks it does? To understand this, you have to know what is done in chemical thermodynamics and bioenergetics, (thermo applied to living systems). If you want to. In nutrition, you can make up your own stuff. But, if you want to do what is done in chemical thermodynamics, you focus on the system itself, not the system plus the environment. So, from the standpoint of chemical thermodynamics, the calories in food represent the heat generated by complete oxidation of food in a calorimeter. There is an additional point that we assumed in passing. In chemical thermodynamics, the energy goes with the reaction, not with the food. It is not like particle physics where we give the mass of a particle in electron-volts, a measure of energy, because of E=mc2. What this means, practically, is that the 4 kcal per gram of carbohydrate is for the reaction of complete oxidation. Do anything else, make DNA, make protein and all bets are off. The bottom line is that, contrary to what is usually said, thermodynamics does not predict energy balance and we should not be surprised when one diet is more or less efficient than another. In fact, the question to be answered is why energy balance is ever found. “A calories is a calorie” is frequently what is observed (although there is always a question as to how we make the measurement). The answer is that insofar as there is energy balance, it is a question of the unique behavior of living systems, not physical laws. Two similar subjects of similar age and genetic make-up may, under the right conditions, respond to different diets so that most of what they do is oxidize food and the contributions of DNA or protein synthesis, growth, etc. may be similar and may cancel out so that the major contribution to energy exchange is the heat of combustion. But thermodynamics is really not about the first law which, while its history is a little odd, it is not revolutionary. Intellectually, the first law is related to conservation of matter. Thermodynamics is about the second law. The second law says that there is a physical parameter, called the entropy, almost always written S, and the change in entropy, ΔS, in any real process, always increases. In ideal, theoretical processes, ΔS may be zero, but it never goes down. In other words, looking at the universe, (any system and its surroundings), energy is conserved but entropy increases. The first law is a conservation law but the second law is a dissipation law. We identify the entropy with the organization, order or information in a system. Systems proceed naturally to the most probable state. In one of the best popular introductions to the subjects, von Baeyer’s Warmth Disperses and Time Passes, entropy is described in terms of the evolution of the organization of his teenage daughter’s room. 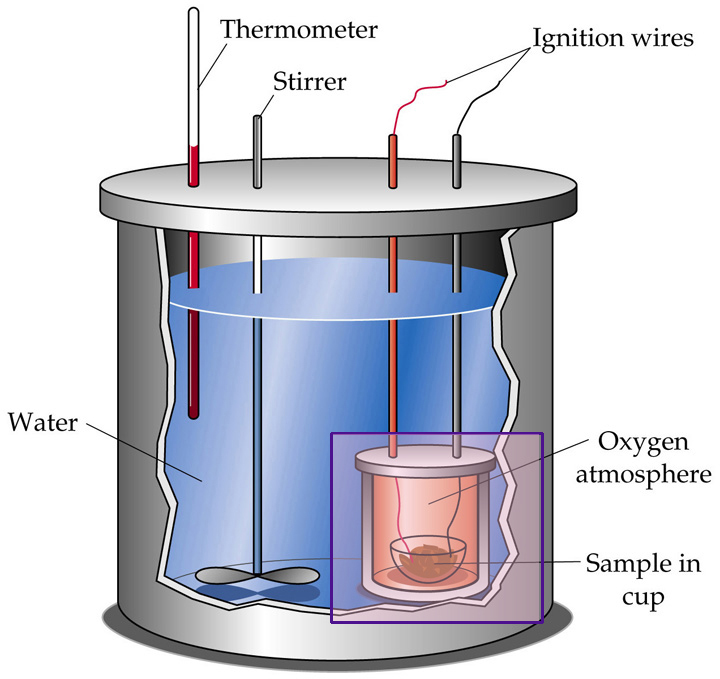 To finish up on calorimeters, though, there is Lavoisier’s whole animal calorimeter. 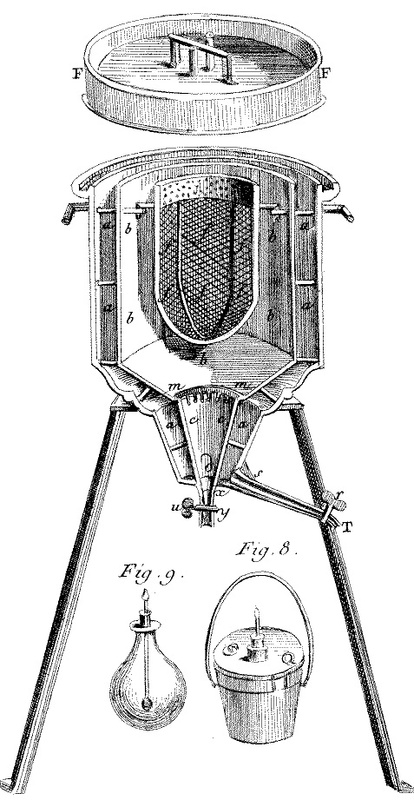 One of Lavoisier’s great contributions was to show that combustion was due to a combination with oxygen rather than the release of a substance, then known as the phlogiston. Lavoisier had the insight that in an animal, the combination of oxygen with food to produce carbon dioxide was the same kind of process. The whole animal calorimeter was a clever way to show this. The animal is placed in the basket compartment f. The inner jacket, b, is packed with ice. The outer jacket, a, is also packed with ice to keep the inner jacket, cold. The heat generated by the animal melts the ice in the inner jacket which is collected in container, Fig 8. Lavoisier showed that the amount of carbon dioxide formed was proportional to the heat generated as it would be if an animal were carrying out the same chemical reactions that occur, for example, in burning of charcoal. “La vie est donc une combustion.” His collaborator in this experiment was the famous mathematician Laplace and people sometimes wonder how he got a serious mathematician like Laplace to work on what is, well, nutrition. It seems likely that it was because Laplace owed him a lot of money.